During my time as an undergraduate student, I studied abroad for a year in Japan at Akita International University to further my studies in my specialized area of Asian studies. Akita International University is one of Japan’s cutting edge schools in which all classes are taught in English; it is also recognized as being one of the first universities in Japan to base its school system on the American university system. Despite using a whole different system than most Japanese universities, the job process for these college students remains the same. I was lucky to observe this process because I was there during both the winter and spring semesters. It intrigued me as the job process there is a totally different than what you would find in the United States. 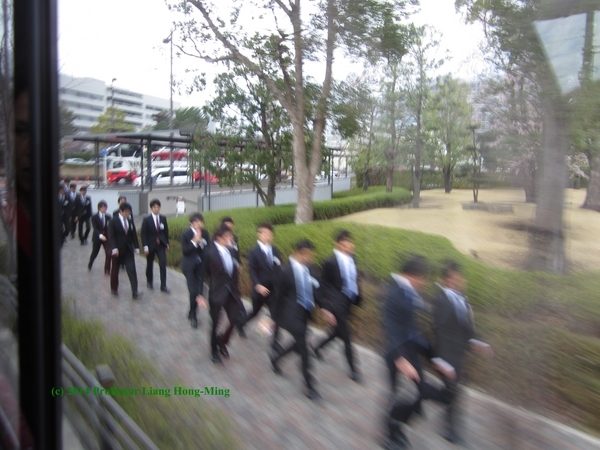 The amount of education Japanese companies want students to have is also very different. In the sections below, I will explain the job process many Japanese students face and the consequences should they obtain too much higher education. The job hunting season for Japanese students usually begins in early winter of their senior year and ends at the end of spring. Many students either go out and search for opportunities or find them at job seminars that companies host for prospective students in which they are told about the company. Students then can talk to a recruiting representative and leave their resume if interested. If selected they will be called back for interviewing in April. Some students even get informal offers before this time, depending on the student’s resume or situation. I was lucky to witness a couple of these seminars being held at AIU when I studied there. I observed not only how different the recruiting process was but how different the resume was. The resume was styled as pre-arranged information sheet which listed your education and other information, along with a passport photo of yourself. While I was shopping at the mall during job- hunting season, I often observed students taking resume photos in an arcade-like photo booth designed for that. Another thing I saw at the mall during this season was the number of major sales for black suits which were the standards for both men and women when attending seminars, interviews and other functions associated with the job hunting process. During this time many students would also miss class to attend these functions, which some professors accepted as the norm and some did not, often getting upset with the students and lowering their attendance grade or giving them an extra assignment. It was mentioned a couple of times at the beginning of class. I had two professors, one who accepted and one who did not. The differences in views between the professors might have been associated with cultural differences as the professor who accepted the absence was Japanese while the other was American. The job process is very stressful for students because if they do not get a job during this time, they will be out of luck until next April. The hiring process only happens once a year. The stress associated with this deadline has in recent years caused suicide rates among young individuals to increase. Some of the other causes have to do with Japan’s declining economy, depression associated with not being hired and a decrease chance of them being hired for the next job hunting season as they are now no longer newly graduate. Japanese companies do not favor degrees higher then a bachelors when hiring new workers, and actually discourage it. It is their belief that master’s degrees and Ph.D are essentially worthless as they do not teach students any job skills. Instead they feel that they can provide the required knowledge through company training and specialized school, if need be. Japanese Companies are also very picky about when a student graduates from college. As I mentioned above, companies usually want new graduates who will be easy to mold from the get- go. So if you miss the boat during the senior year, a student’s chances of getting a job next year will decrease because they will now be competing against the next batch of new graduates. So the bottom line is that unless your advanced degree is in something like law, medicine, engineering or some science, your chances of getting a job with many Japanese companies is slim. Most students who do go on to get advanced degrees in other areas go into academia or work or study in another country, like the U.S where the job prospects are higher. In summary, based on my experience in Japan, it would seem that educational and hiring practices may vary depending on different cultural systems. I aggree with Japan’s dismiss of the master’s and doctoral studies. Both of my parent’s have achieved after grad degrees, and those are of little consequence as to how they have acheived their current jobs. My father’s doctorate in rocket science, is only tangentaly related to his career in computers. His thesis has only served the world in that it is useful when flattening out large pieces of papper to weigh the edges down with equal sized books, he himself declares that the only thing his doctorate gave him was the right to wear a poofy hat, but nowhere to where it. I found the education and hiring process very interesting and similar to Bhutan’s. For the longest time, countries like mine valued degrees from foreign countries a lot more than they did the “local” ones. However, in recent years, I noticed that a lot more jobs are available to people with degrees from Bhutanese colleges, mainly because this usually means that they speak the native language better than those students who are educated outside. Like mentioned above, it is interesting to see the different cultural systems and how they play a role in the world. I think the differences in education systems across the world is very interesting. Throughout the years I have talked to many of the Foreign Exchange students that come to my high school and they almost always think that America schooling is easier. They tell me that they are amazed how much down time we are given. I wonder if this slip in education standards for America compared to other countries is also greatly contributing to our economic and social decline. Wow, it is really interesting to hear about another culture’s education and hiring system. That sounds even more stressful than trying to get a job here in the U.S. I can imagine that suicide rates would rise. I wonder why they only hire in April? I learned to understand a long time ago that the educational systems across the world vary in some ways and in others, drastically. My knowledge of the job process in the U.S makes it hard for me to comprehend the process many Japanese students go through for a job. I am a couple years shy of my undergraduate degree and that pressure is beyond anything I would ever desire or need to step into the real world of the work field. From the post, I am not quite familiar with the strategies of Japan-based companies during the hiring process but it seems that if they only strive for students they can mold, that allows for little change and progress within the company which would minimize their expansion of success. This is intriguing. I feel that America has a much more accessible job market, but there are similarities. In fact, for certain professions, such as the one I plan on having, you must be hired before a certain time. If you are to be hired as a teacher, it needs to be before the school year, this can put a lot of stress on graduates fresh out of college because they must find a teaching position soon. Additionally, I was asked recently about whether there was much of a demand for history teachers- so not only do I need to worry about being a good candidate but also whether there will be openings. As for the type of education affecting the students in Japan and Bhutan, I feel that many places in America look at where a student got there degree when hiring. Thank you for this wonderful article! I must admit that the two things that surprised me most were the fact that there were accessible suits for the interviews and photobooths designed for taking resume pictures. Just recently on our CSS campus we had a photographer come over and take professional photos for students over 2-hour slots on two different days. My friend and I missed them and, when looking around for someone else to take our picture, we were told that that sort of service was provided for a fee of about $150. Though I cannot speak for the universality of that fee, it blew my mind that there can be such a stark difference in the treatment of something so subtle as the resume photograph. Very interesting work. Having lived in Japan with my family once upon a time as well, my parents would always tell me how lucky I’ll be to be educated and work in the United States largely because of these very stresses. They would also mention that depression and these dark thoughts even manifested in children who would be required to take arduous tests at ages as young as kindergarten that might determine their entire future. I don’t know if this is necessarily true, however given your report, one might not be quite so surprised. This article was very interesting and intriguing! In several ways, the job hiring process is very similar to that of the U.S., but also shows so many differences. One thing that really stood out to me is that the hiring process only happens once a year. I cannot imagine the amount of pressure these college students feel during their senior year. I found this article to be very interesting. i never realized that there was an entire English speaking university in Japan, and that is actually kind of cool. I think that the most interesting part of the article is when you talked about how the post undergrad degrees were useless, and that came to me as a shock because i had never thought of that before. I found the article interesting in many ways. I was intrigued when reading about the job hunting process in Japan. From what I know so far it is in ways different than the one here in the U.S, but at the same time they both had similarities. While I was reading it made we wonder how would the job hunting process be in Mexico, and how it is different from the one here and in Japan. This was definitely something that I never knew before. I had no idea how stressful and hard it is to get hired in Japan. I feel like their process has similarities as well as differences compared to that of the US but probably more differences after reading this article. The US seems a little more lenient than Japan but Japan sort of has to be more strict because of their population size compared to the US. It was a very intriguing read!